NVIDIA Tegra X1 features octa-core CPU cluster, consisting of four Cortex A57 and four Cortex A53 cores with a custom CPU interconnect and cluster migration. On the GPU side, NVIDIA has turned to using its latest generation Maxwell architecture in a GPU with 256 CUDA cores. The chipset’s 3D score of over 21,000 is particularly impressive. As promised during the chipset’s CES announcement, it doubles the performance of last year’s Tegra K1. 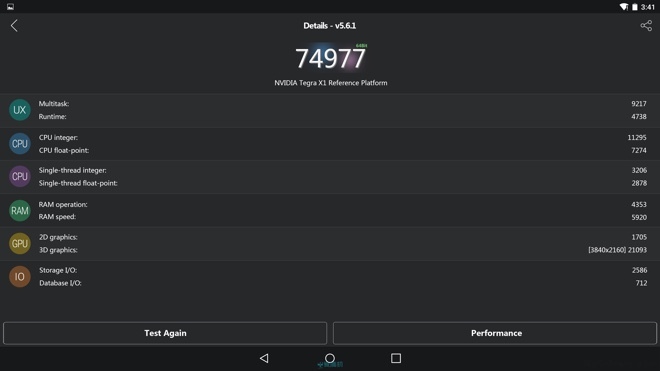 Overall, it looks like Tegra X1 will be the mobile chipset to beat this year. For comparison, a leaked AnTuTu benchmark of the upcoming Samsung Galaxy S6 and its Exynos 7420 SoC reveals a score of 60,978. NVIDIA will likely unveil a Tegra X1 device on March 3. The chipmaker promises to “redefine the future of gaming” with its latest product.